Bada Ganpati Temple in Indore, Madhya Pradesh is famous for worshiping one of the biggest Ganesh idol in the India. 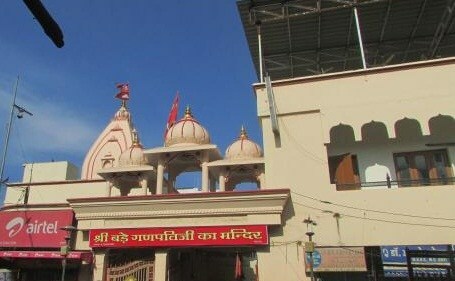 Bada Ganpati Temple is a major pilgrimage center in Indore. 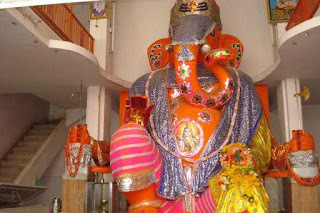 The statue of lord Ganesha here is believed to be the largest in the whole world. 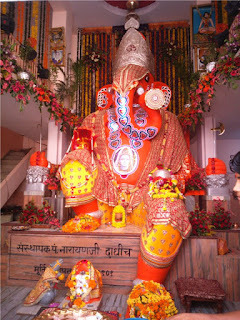 The Bada Ganpati Temple or Khajrana Ganesh Temple is situated very closed to Rajwada or Holkar Palace in Indore.Here is some Fact about Bada Ganpati Temple in Indore Madhya Pradesh India. How to reach By Bus or Road: You can reach Bada Ganpati Temple by hire taxi or cycle rickshaw from a nearby location in city. Bada Ganesh Temple is located near the heart of Rajwada city also known as Holkar Palace in Indore Madhya Pradesh India.The temple was built in 1875 and built by reign of Rani Ahilya Bai Holkar.The temple is dedicated to Hindu Lord Ganesha.The mythology about the Bada Ganpati Temple is one of the residents of the city of Avantika present known as Ujjain dream of Lord Ganesh in his sleep. After that he was built this temple. The idol of lord ganesh was found in a well in 1735. It was taken out from there and a temple was established in 1735 by Ahilyabai Holkar. The idol of lord ganesh is world’s largest idol with 8 meters or 25 feet in length from crown to foot. Vinayaka Chaturthi is one of the most important festivals that are observed in this Khajrana Ganesh Temple for Lord Ganapati. Bada in Hindi means large, so the temple is known as Bada Ganapati Temple. The color of the lord Ganesh statue is Bright Orange. Bada Ganpati temple is situated at the junction point of Bijasan road, Jinsi Road , malharganj road. The statue building with bricks, stones, lime, molasses, seven plateaus soil, horses, cows and elephants crushed clay and mud, Pancratnon powder, diamond, emerald, pearl, ruby and topaz and holy water of several shrines. The structure of the statue made with gold, silver, bronze, copper and iron. Ganesh festival is major festival held by temple on that days lots of visitors visit this temple.